which decayed to thorium-227 and francium-223. has at least thirty four isotopes. with a half-life of less than 22 minutes. has been found or synthesized. gathered, it would vaporize itself. and, kneeling before nature, we were nothing. 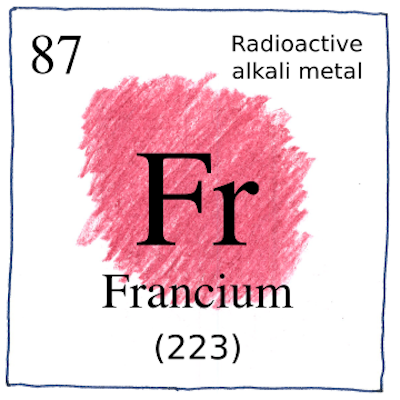 Francium was the last element to be found first in nature. All the remaining 29 known elements have been synthesized first. Although astintine, for example, occurs in nature, it was discovered first by bombarding bismuth with alpha particles.